Trev Rich On His "Spider-Verse" Glory & Joe Budden's "Rap Star Boot Camp"
Trev Rich didn’t know he was going to wind up on the Spider-Man: Into the Spider-Verse soundtrack — but he did. While out in Los Angeles, the Denver-based artist was invited to several recording sessions where he soon found himself in the company of Grammy-nominated producers working on something big. But there was one problem. On his way to the one of the sessions, Trev left his wallet in an Uber. He was almost ready to turn around and head back to Denver, but Matt McNeal – an A&R from Dreamville Records — convinced him to stay. That was that. As fate would have it, Trev ended up on DJ Khalil’s “Elevate” alongside Denzel Curry, YBN Cordae and SwaVay. The title of the song and the fact it ended up on Spider-Verse is eerily prophetic. Fans of Trev Rich might take notice the name on “Elevate” isn’t credited to his stage moniker. It’s actually under Trevor Rich, his publishing name. Trev is focused on throwing himself into songwriting and embarking on this new chapter. Since returning to Denver from Los Angeles, Trev has thrown himself into the studio. “I’m really in a secluded area,” he says. “Nobody’s really up there when I’m outside. Nobody knows me. It’s a pretty cool place to be. I can just get my mind right to record because I didn’t have any distractions in L.A., which is why I feel like I succeeded. I had to put myself in that same boat now that I’m back home, which is very hard because you’re home. My family’s here. I got friends here. I got a lotta things going on here. Trev’s background is already seeped in glory. 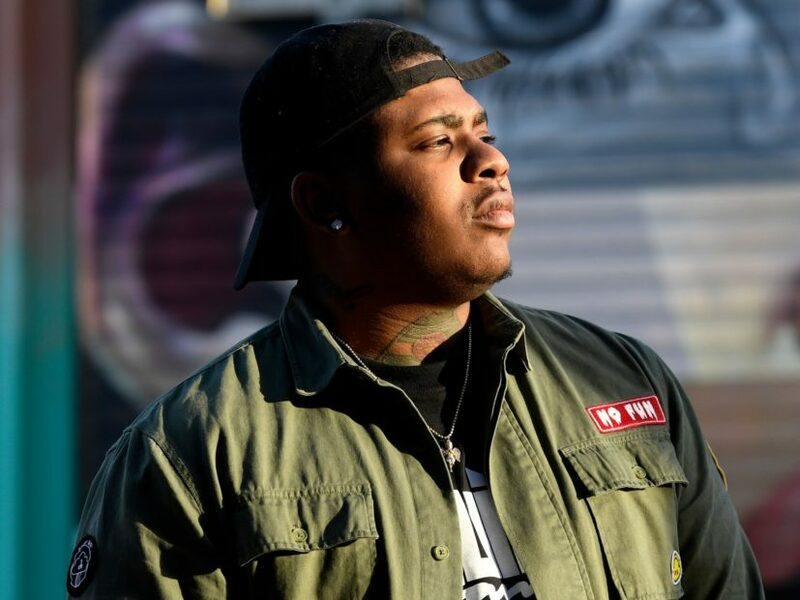 He was briefly signed to Cash Money Records, spent time on the road with Joe Budden and actually lived with the Slaughterhouse vet for a period of time. Looking back, he realizes that time with Budden really pushed him to become a better artist overall. “It’s like rap star boot camp,” Trev says of the experience. “You got your own room. You gotta get up, you gotta go to the studio. You gotta be in the studio all day with Joe. And it’s like, ‘Oh that verse isn’t good enough, do another one! Ah that’s not good enough, do another one!’ It was just the honesty. Despite the valuable lessons Trev was learning working with Budden, he knew he had to leave. “It was really pride,” he admits. “In the time while I was out there with Joe, we didn’t have jobs. We didn’t have income coming in. So we really had to depend on Joe. It was multiple artists in the house who had to depend on this one person. I got to a point where I’m like, ‘Yo, I can’t depend on another man to eat food during the day’ so I ended up going back to Denver. #Clarity out now! If you got it drop them ?? ?’s and tag somebody who needs to hear it! Trev’s journey into publishing doesn’t mean the end of Trev Rich — not by any stretch of the imagination. He’s simply embracing new opportunities. At 29 years old, Trev is really just getting started. He turns 30 on May 28 and will undoubtedly be rocking a mic somewhere.